Scene setting: Traffic was more complicated than usual in Paris on saturday morning, with the Gilets Jaunes demonstrating at the Place de l’Etoile. But down the road, on Avenue de Friedland, it was a different event causing traffic jams: it’s been ten years since Joseph Altuzarra presented his very first collection to the public, and today he was celebrating with a show in the gilded salons of the Hôtel Potocki. The decade has been good to the French-born New York-based designer, who has risen from being Carine Roitfeld’s young protégé to a solid independent business, known best for his working girl-worthy luxurious collections. Best in show: This time, though, instead of work, it was all about play, and very naughty play at that. 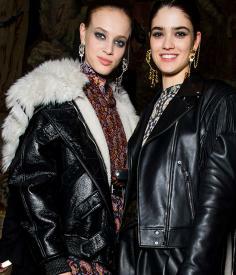 The designer has been inspired by the work of Robert Mapplethorpe and the fetishisation of leather, harnesses and biker gear. Throw a good dose of old-time glamour in the mix and the result is a collection oozing sensuality and excess, where satin wrap skirts, thigh high boots and asymmetrical draped dresses are paired with oversized shearling-lined aviator jackets and fringed leather coats, and where a selection of intarsia woollen sweaters gave way to a series of golden lamé pleated numbers. ‘I love lamé’, explained Joseph Altuzarra backstage, adding: ‘I’ve been spending more time in Paris lately than I used to in the past few years, I think it’s starting to show in my collections’. Europe is undoubtedly having a good effect on him.